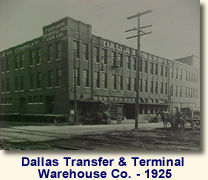 Company Profile - Dallas Transfer and Terminal Warehouse Co.
Dallas Transfer & Terminal Warehouse Co. was established in its present location in 1985, with roots in Dallas that date to 1875. The owning family has been involved with the company since 1919. Its President and Chief Executive is E. John Ward. 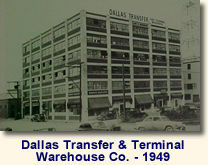 Dallas Transfer operates with 25 people from a company-owned facility. The facility totals 252,00sf on ten acres located in a modern industrial park near the center of the Dallas-Fort Worth Metroplex.